There are 120 of us crowded into this hot Upper Room in Jerusalem. But we remain cheerful. First, we finish our sharing and prayer. Each of us eat a morsel of bread and a sip of wine and pass the bread loaf and cup to the next disciple. Jesus asked us to do this at His last supper with the Apostles 43 days ago. We do this in honor of His body and blood in remembrance of His crucifixion and death. Our prayer is joyful, thanking God for actually seeing Jesus after His resurrection from the dead. To us that miracle is the overwhelming proof of Jesus being the Son of God and why we are still together. Suddenly, a hush comes over our conversations as everyone anticipates a vote. Now, a difficult decision needs to be made—who will become the Apostle replacing Judas Iscariot? Will it be Justus or me, Matthias? I’ve been a follower of Jesus our Messiah. I volunteered as a caretaker of the donkeys which carry the food and supplies for His group. For three years we journeyed with Him from town to town while He preached and cured people at each one. I was born a Jew and was educated in our Synagogues. Jesus was born in my home town of Bethlehem, over 33 years ago. I was 9 years old then. Fig. 1. 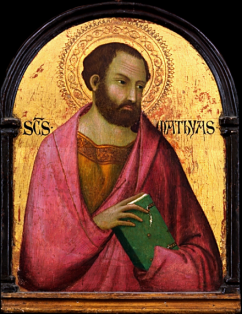 Matthias (from a Greek Orthodox painting circa 12th Century). The other disciples are like brothers to me. However, I am not optimistic about being selected to join the original 12 Apostles who were chosen by Jesus Himself. This voting process makes me nervous. Justus is an excellent disciple. He and I were followers of John the Baptist when we saw Jesus baptized in the Jordan River. He listened carefully to Jesus and is a good teacher of our Jewish scriptures. He is very friendly and has a close circle of friends among the disciples. His full name is Joseph Barsabbas, but we call him Justus—which is interpreted to mean “an upright person.” He will probably be selected instead of me. As a humble manual laborer and herdsman for our group my work is usually been performed behind the scenes. My mother, too, has travelled with us as a volunteer cook. Although friendly with everyone, I really have no strong vocal supporters. I was nominated along with Justus because both of us had been eye witnesses of Jesus from the time of His baptism by John the Baptist until He ascended into Heaven. We both witnessed Jesus teaching and performing powerful miracles. I heard and saw everything from the sidelines while doing my tasks. We travelled all over the country-sides of Galilee, Samaria, and Judea, many major towns such as Jerusalem, Nazareth, Caesarea Philippi, and even towns along the shores of Galilee Lake such as Capernaum and Bethsaida. One time, Jesus chose Justus and me to become two of the 72 disciples to whom he gave authority and power to cure people who were sick and to expel demons from them when necessary. We were sent off working as a team – as one of the 36 pairs going from town to town in Judea teaching and healing people, and introducing them to the Kingdom of God same as Jesus was doing. At His command, we took no food or money with us. We depended solely upon God to provide everything we needed as well as the miracles we performed in His name. Suddenly Peter, our leader, stands up. “I will not vote. Jesus personally invited and chose each of us, the original 12 Apostles, to witness His miracles and to be taught by Him. So, it is appropriate that God alone should choose the replacement for Judas Iscariot. Judas travelled with us for three years after Jesus chose him to be an Apostle. Now, he has killed himself rather than to ask for mercy, to repent, and to live in the shame of his betrayal of Jesus. Sadly, it was Judas who kissed Him that dark, evil night in order to identify Him for some of the Roman and Jewish authorities who hated and killed Jesus so cruelly. He did all that for the thirty pieces of silver he received from the Temple’s authorities. Our Jewish Scriptures tell us someone must take the place of Judas so that there again will be 12 in our circle of chosen leaders. As I listen to Peter, I am overwhelmed by the memories of everything that has occurred recently. Of course, Peter and all of us became fearful and sad when Jesus was crucified, died and was buried in a tomb guarded by soldiers. We thought the authorities would imprison or crucify us next. Then came Jesus’ resurrection from the dead. He is alive again! We became ecstatic and overjoyed when we saw Jesus—alive and walking with us for 40 days! He told us not to be afraid; we talked and ate with Him. He even forgave Peter for denying he knew Him after He was arrested. Today, we saw Jesus physically ascend up into the heavens. Fig. 3. 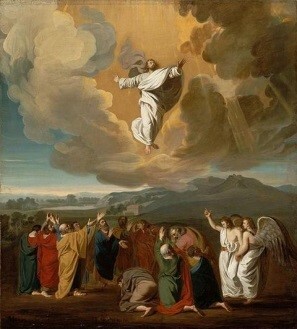 Ascension of Jesus to heaven depicted in a painting by John Singleton Copley, 1775. We all love and admire Him. Yet, no one asked Him about whom He wanted to replace Judas. Fig. 4. Peter and the other Apostles pray over the candidates. You can feel the tension in the air among some of the disciples. Peter is not allowing anyone to speak in support of Justus or me. Justus had a number of strong vocal supporters eager to recommend him as the replacement. I really fear a confrontation now, and I decide that if there is conflict over my nomination I will offer to step aside. The unity and mission of these disciples is much more important than my being chosen as an Apostle. I remember once when the chosen 12 argued with each other as to who was the greatest among them. Even the mother of James and John, the Zebedee brothers, tried to influence Jesus to be sure that her sons would be chosen to be on His left and right hand sides when His kingdom comes. Jesus responded such an honor was not for Him to give, but for His heavenly Father to choose. Then He asked if they were willing to drink from the same cup of pain as He was. Jesus warned us all not to seek honors; instead, we are to serve one another. One time he even picked a child and placed him in front of all of us. He announced that unless we were as dependent, innocent, and humble as that child, we could not enter the kingdom of Heaven let alone be leaders among the Apostles. Finally, almost all of us abandoned Jesus when He was arrested, tortured and crucified. You would think because of our reactions, we had learned our lesson about our faults, personal pride, and the need for humility. But no, again we displayed jealousy, fear, anger, in-fighting, false pride, loathing, indecisiveness, guilt and lack of forgiveness. Fortunately, we were given 40 days to pray, contemplate, and regroup whenever Jesus appeared to us. I feel that Jesus has not abandoned us after His resurrection into Heaven. He will help us grow and understand each other as our group executes His great commission to teach the world what we witnessed. I silently put my trust in Him. John, who is the youngest Apostle among us, springs up and runs downstairs to the building’s courtyard stable to gather several clean straw sticks. He immediately returns and gives them to Peter. Fig. 5. 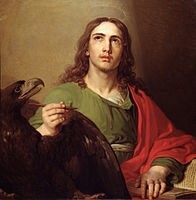 John, Apostle and Gospel writer. Peter arranges the straw sticks in his hand so that the tops are level, while strands of uneven length appears below the clasp of his hand. Fig. 6. Choosing a straw by lot. Justus chooses first. It is a long straw. I close my eyes, say a silent prayer and take a deep breath to summon my courage. Feeling serenity, I reach out and choose a straw from Peter’s fist full of straw. A loud cheer shakes the room. As I open my eyes I am surprised to see that the straw I picked is much longer than the one drawn by Justus. He happily rushes up to me with a smile to congratulate me and to kiss my cheek - as is the custom of our time. Each of the 11 Apostles in turn gives me a big friendly hug and kisses me on my cheek. They all praise God as they congratulate me being the choice of His Spirit to become one of the “12 chosen Apostles.” Sunlight pours through the windows. Everyone appears happy. I quickly glance over to where my mother is standing in the back of the room. Peter’s mother-in-law and Mary, the mother of Jesus, are hugging Mom as they share this happy moment; so too is the mother of James and John. These women travelled with us and cooked many meals for Jesus and all of His disciples. They witnessed many of His teachings, and miracles. They also have a lot of memories and thoughts to share. What joy is in this Upper Room again! I feel the love of Jesus around us. It’s as if a special blessing and strength entered my body. I am alert, without fear, and ecstatic as never before. Hallelujah! I thank God for His mercy and love to pick me to be the “replacement.” Now, I can be sent out with the authority of an “Apostle” to tell everyone what I personally witnessed Jesus say and do. I feel in me the power of the Spirit of God who will heal and cure the people. Hallelujah! Handel’s Messiah: “Hallelujah!” Sung by the University of Notre Dame Chorale at St. James Church, Arlington Heights, IL. “Here I Am, Lord” composed and sung by Dan Schutte. “Be Not Afraid” by St. Louis Jesuits & Bob Dufford. Bible scene art on screen. Lyrics in description. "Communion Song” music video by Stephen Bennett. A modern music presentation with band and accompaniments and lighting effects of Awesome City Music. (About bread/wine Jesus’ body/blood.) Lyrics included. “12 Disciples Song” The Bigsby Show uses folk guitar and singing to name each of the 12 chosen Disciples later called Apostles with lyrics on screen (includes Matthias). The Upper Room is also the room of the Last Supper and stands above King David’s Tomb. Matthias - Wikipedia. Multiple viewpoints presented regarding Matthias (shows art works).
. Mary (mother of Jesus) - Wikipedia Multiple viewpoints presented regarding Mary. 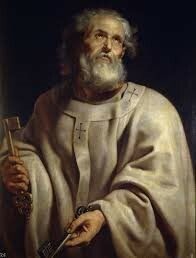 Saint Peter - Wikipedia Multiple viewpoints presented regarding Peter, the leader of the Apostles. Twelve Apostles - Wikipedia Multiple view-points presented regarding the Apostles of Jesus. Female Disciples of Jesus - Wikipedia. Multiple viewpoints presented regarding the women following Jesus who are identified in the New Testament. Joseph Barsabbas (also known as Justus) - Wikipedia. Multiple viewpoints presented regarding Justus who was nominated along with Matthias. The Cenacle - Wikipedia. Multiple viewpoints presented regarding a place also known as the Upper Room in Jerusalem and traditionally held to be the site of The Last Supper. New American Bible - Revised Edition: the Mission of the 72 sent to heal the sick and expel evil demons which had entered people. From Gospel of Luke Chapter 10 (with options for commentary and notes). Cenacle – Pictures & description regarding the Upper Room in Jerusalem and traditionally held to be the site of The Last Supper. Church of the Apostles found on Mt Zion. Article in Biblical Archaeological Review. Also known as the Upper Room, Cenacle, and Room of the Last Supper. Upper Room Location and Architecture at BIBARCH™ describes Biblical Archaeology regarding the Cenacle. Upper Room Location and Architecture at BIBARCH™ describes Biblical Archaeology regarding the Cenacle. The Catholic Encyclopedia if you want to look at another viewpoint of any of the terms in these multi-dimensional LINKS. Eucharist also called Holy Communion, the Lord's Supper (bread & wine). Wikipedia - multiple viewpoints presented. The Acts of the Apostles: Holy Bible [Full Film 3 hr 20 min]. Starts with the first chapter including the upper room where Matthias is chosen by lots. Then, Holy Spirit descends on the disciples. The Gospel of Matthew (FULL MOVIE 4 hr 18 min) is the first book of the New Testament. It tells of the life, ministry, death, and resurrection of Jesus of Nazareth. Fig. 2. 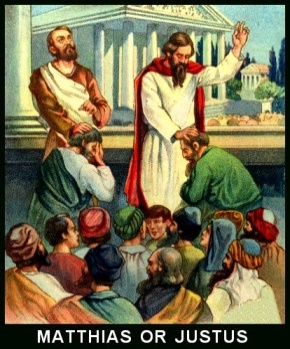 Peter, leader of the Apostles.